By Austin Lefevre Socially acclimating fishes is still in its infancy to the masses. 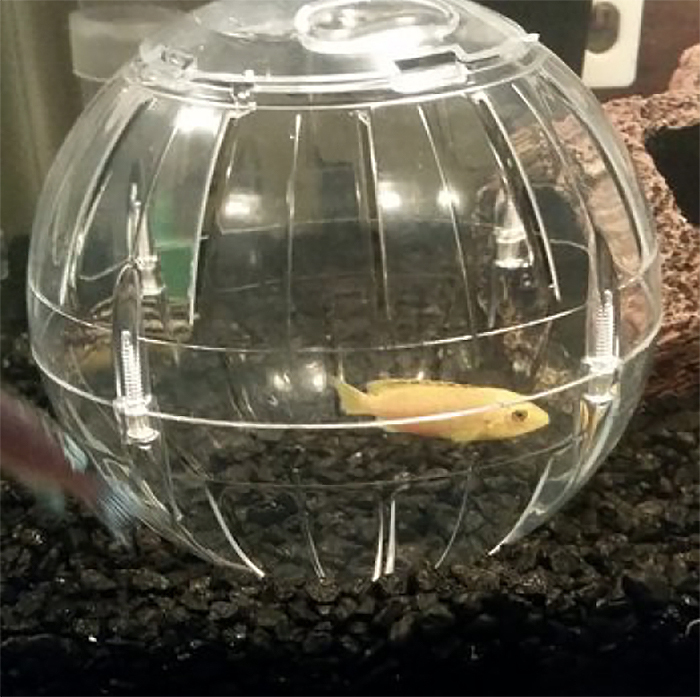 We’re finally seeing more discussion and progress towards the average hobbyist conditioning or quarantining fishes, but after that the fish is left to its own devices and plopped into an aquarium with a mob of territorial fishes. This can lead to the existing fishes beating up on the new addition, which can quickly nullify all the hard work you’ve put into conditioning the animal over the past weeks. An egg crate divider separates these two angelfish. Photo by Austin Lefevre. Social acclimation is incredibly easy and gives the new addition a much greater chance of settling in. Even for those that decide to skip quarantine or conditioning practices this is a great method to follow which will increase success. The idea is to allow fishes to interact with one another while preventing physical contact. We can’t forget that fishes are like little kids. They act completely differently when there aren’t human eyes peering into their boxes. I see a lot of people adding a fish and thinking everything will be fine, then within a few days to weeks the new addition ends up dead. An existing fish has established its territory, a social hierarchy with other fishes, and knows what and when you feed. Think of the new fish as a kid flung into an unfamiliar high school mid semester. The kid will likely get bullied, have no place to sit during lunch, and might get beat up. High school students are ruthless, fishes are more so. 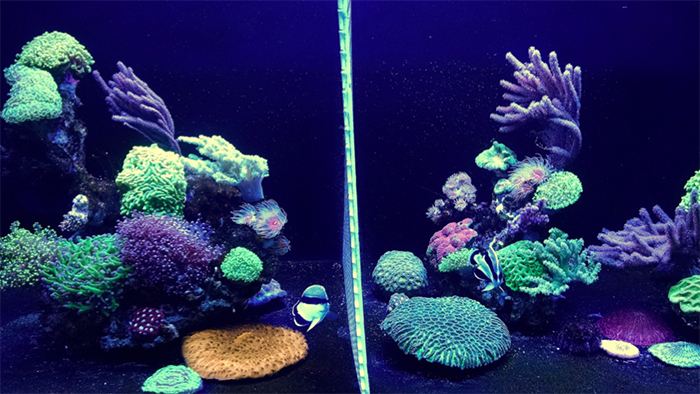 Old school methodologies to prevent new additions from feeling the wrath of tank mates include: moving the rocks around, turning off lights, and feeding heavy prior to adding new fish. We can debunk those fairly quickly. First, who wants to alter their aquascape in a reef? 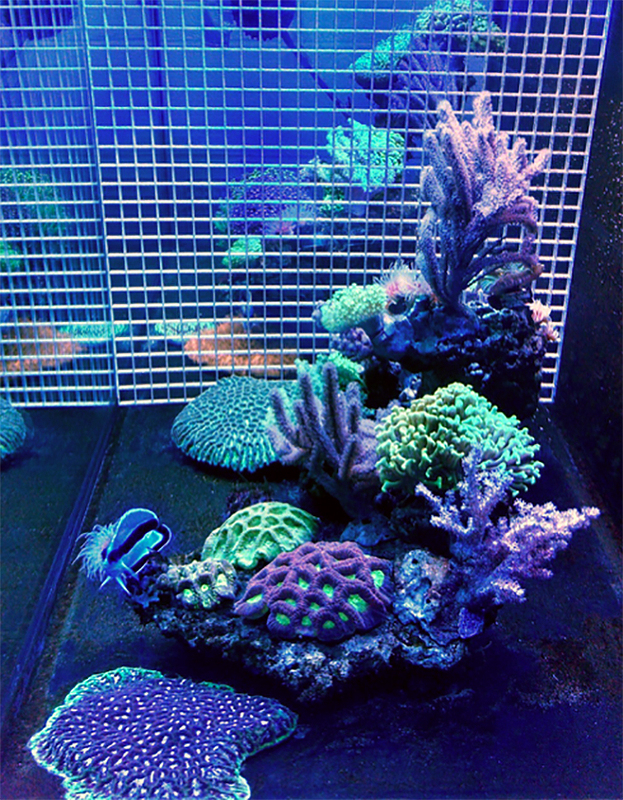 You’ve worked hard to create that perfect rock structure, and corals have become accustomed to light intensity and flow patterns. Next, turning off the lights seems to make sense for the existing fishes, as they should ostensibly fall asleep. However, fishes recognize their standard photoperiod so shutting off the light ‘mid day’ probably won’t get them snoozing expeditiously. Now the new fish has been cast into complete darkness without knowing where any hiding places are or who they’re up against. How would you feel if someone pushed you into a dark room you’ve never been in and shut the door? Finally, adding food to the tank will briefly occupy your little lovelies while you try to sneak the new fish in the backdoor without notice. Two minutes later when all the food has been snatched up, it’s on like Donkey Kong. 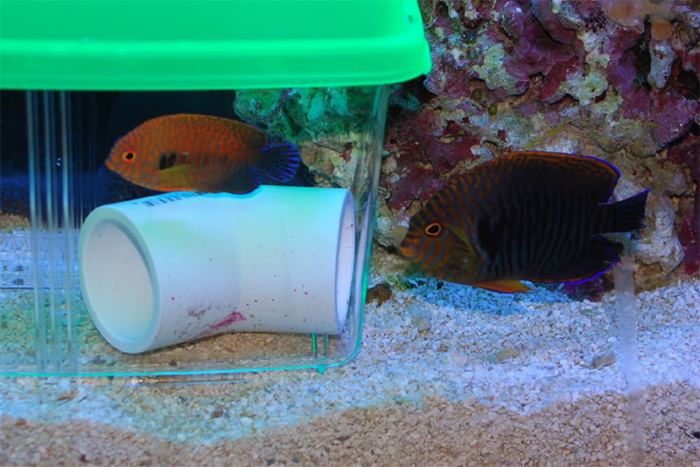 An established wrasse inspects a new addition being held in an acrylic acclimation box. Photo by Bradley Syphus. There are several ways to implement social acclimation techniques. The go-to these days seems to be commercially produced acrylic boxes. They’re ready to use right out of the package and are generally affixed to the side of your display with suction cups or magnets. Some are heavy enough to be situated on the substrate. You’ll want to place small rocks or PVC pieces of adequate size to provide cover for your new acquisition. Make sure there’s sufficient flow going through the box. You don’t want it to become a dead zone where food rots and fish cannot swim against current for exercise. If necessary add a small power head blowing directly at the box. You’ll be the judge if it’s necessary to directly feed the acclimation box or not. Sometimes enough food flows through the box during routine feedings. Egg crate divider keeps these angelfish from physically interacting, while providing plenty of room to swim. Photo by Austin Lefevre. 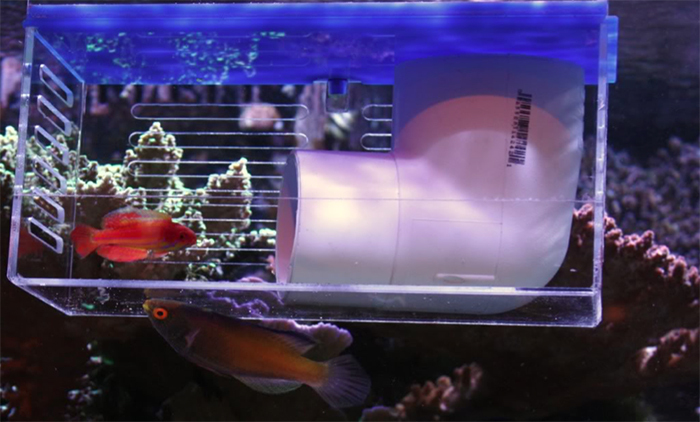 Egg crate (light diffuser) is a phenomenal option to either make your own acclimation box or divide the tank entirely. This is particularly useful for large fishes as most of the commercially available acrylic boxes are relatively small. Use zip ties to construct a large box that can be hung from euro brace or set on the substrate. If opting for an egg crate box for smaller fishes, gutter guard type materials can be added to the egg crate to prevent escape. Egg crate boxes also provide more flow through then most acrylic boxes. If you’ve pre-planned your aquascape for an egg crate divider you’ll be thankful. Now rather than dealing with any boxes you can slide a piece in between rock structures dividing your tank. Shoo your existing fishes towards one end of the tank prior to adding your divider then add the new fish on the other side. This will give your new fish the most room possible to acclimate to their new aquarium. 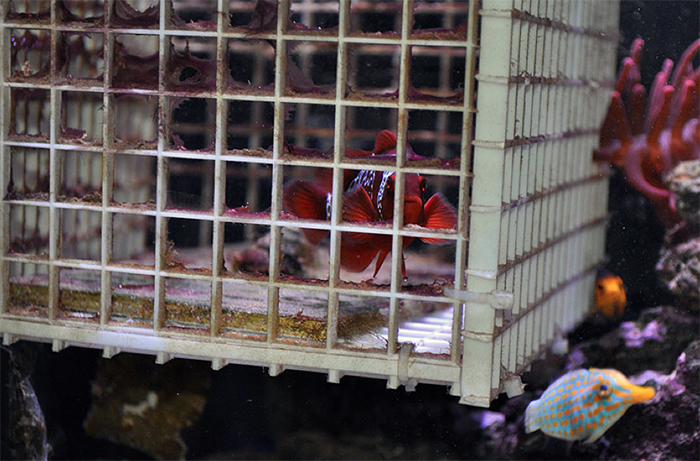 An egg crate box holds this lightning maroon clownfish. Photo by Matt Pederson. Critter Keepers are regularly available at most big box pet shops and make an affordably priced acclimation box with a couple DIY modifications. I used to drill small holes throughout the Keeper, however this inadvertently led to cracking the boxes. Kevin Kohen taught me the ingenious idea of using a soldering iron to burn holes through the plastic. This not only prevents cracking but leaves smooth holes which avoids abrasions to fish held within the boxes. The Keeper’s can be mounted to sides of tanks with magnets or weighted down with rocks. A basic “Critter Keeper” can work well for social acclimation. I recommend adding holes/slots to encourage flow through. Photo by Toddrtrex. Hamster/mouse/rodent balls can also be used. I’m not a huge fan of these as they prove difficult to keep in one place; however the idea is sound and works in the same manner. Another concept I recently saw was implemented by none other than our fearless leader and editor of Reefs Magazine, Randy Donowitz. He used a pop bottle fastened to the aquarium side with holes poked in it to acclimate a new wrasse. While this will work, there are better options in my opinion. Photo by Cami Jo C.
Your new fish will thank you no matter which receptacle you embrace. This method should be a staple in every aquarist’s arsenal to ensure long, happy lives for their fishes. Sometimes fish can be released within a couple days, sometimes a couple weeks. Sometimes never; once in a blue moon you’ll have an existing fish that relentlessly attacks the acclimation container. At this point choose which fish you want to keep since physical attacks will be imminent presumably leading to death. Nonetheless you have saved the new fish. Ultimately you have to be the judge as to when it’s safe to release your new animal. Many fishes have potential to live for decades in captivity provided the right care. It starts with sourcing the best fish possible, followed by proper conditioning and social acclimation. Do yourself a favor. Do the fish a favor. Respect the fish.